The Camco portable propane stainless steel grill is the ideal grill for tailgating, camping, RVing, picnicking, home, patio and boat use. Its compact size and convenient portability makes it easy to use and perfect for the on-the-go chef. It measures 20 inch wide x 9.38 inch tall x 10.38 inch deep. With the legs extended it is 11.5 inch tall. The integrated legs fold under for storage. Even with this compact size for portability, Camco’s Grill still has 125 square inches of grilling surface provide plenty of area grilling for a family of four. Camco’s grill has 125 square inches of grilling surface. Features a stay cool handle and latching lid. Gauge in the lid makes it easy to monitor the grilling temperature. Quick and easy start up with the push-button igniter. 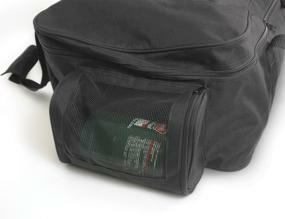 Storage bag includes a convenient side compartment for your LP canister. Camco’s Portable Gas Grill comes fully assembled. No tools, hardware or headache needed. All you will need is a 1 lb LP canister and you will be ready to grill in no time. 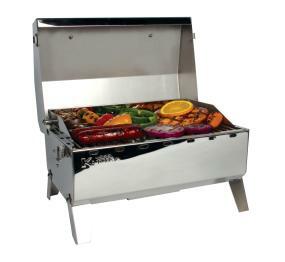 The grill is made of premium stainless steel for years of use. 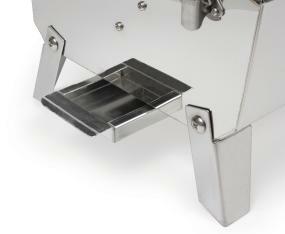 Not only does the stainless steel look good, but it makes clean-up simple. 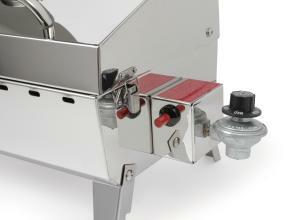 Camco’s grill uses a push-button igniter, making it quick and easy to start the grill. It is fueled from a one pound propane cylinder and the control knob allows you to adjust the 9000 BTU burner. 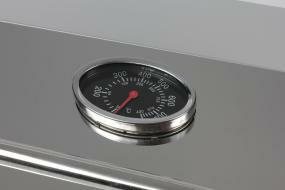 A temperature gauge in the lid makes it easy to monitor the grilling temperature. It also features a stay cool handle and latching lid. The included heavy-duty, weather-resistant, polyester grill bag, keeps the grill free from dust, dirt and scratches and helps to provide lasting protection in any storage environment. The bag also includes a convenient side compartment for your LP canister. 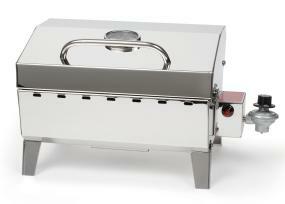 Premium quality, stainless-steel construction and comes fully assembled—ready to grill! Be the first to review “Camco 58145 Stainless Steel Portable Propane Gas Grill with Storage Bag” Click here to cancel reply.